No one becomes a success without a little help from their friends. Over the course of your career, you’ll get a lot of assistance from your personal and professional network, especially when you’re going through a job search. Your contacts will let you know about job openings, write recommendations, help you network, interview you for open positions, and more. Be sure to thank those people who help you along the way. Not only is this polite, but it helps you stay in touch with your network, which will help you with future job searches. When you need to say thank you, it's important to choose the right words. You also need to send your message in the right format. Often, that means sending an email. It’s fast, and most people expect business correspondence to be emailed. However, sometimes you’ll want to send an appropriate card with a handwritten note. Other times, you will send a formal business letter. Staring down the blank page with no idea where to begin? Sample thank-you letters can help you write your own notes and emails. 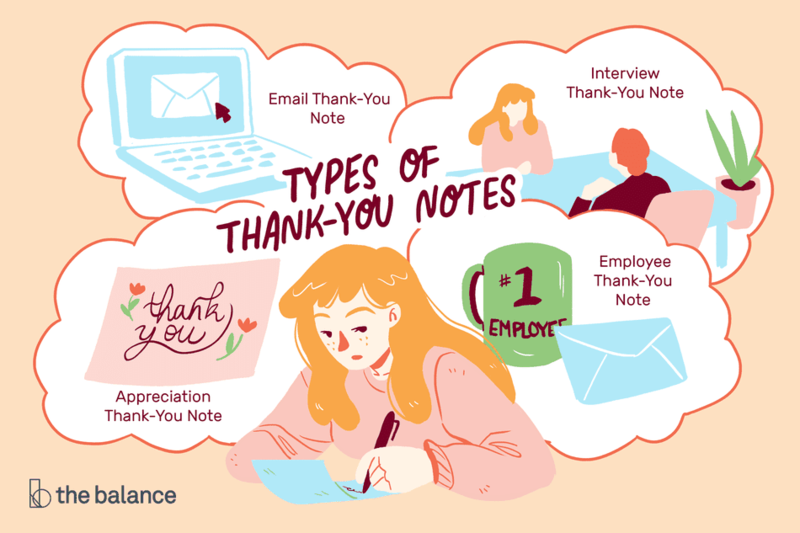 Thank-you notes aren’t just for following up after job interviews. At various points during your career, you’ll want to thank someone for their help. Maybe you’re a restauranteur and a friend helped you with your latest opening. Maybe you’re an office worker and a colleague has just offered to help you organize a committee. Whatever your situation, a little appreciation will go a long way toward showing your contact how much their assistance means. You depend on the people in your network offer you contacts, advice, references, recommendations, and moral support. It is important to say thanks. Sample appreciation notes and email messages can help you express your gratitude to contacts who have provided you with assistance. There are many reasons to thank someone you know through business. You might need to thank a vendor for a quick turnaround or a client for their continued business. You might thank a colleague or manager for their assistance on a project or an intern for their hard work during their time at your company. Regardless of whether you’re sending a physical letter or an email, there are some best practices when sending a business thank-you note. Reviewing samples will help you customize a letter than shows your appreciation. Need to send a thank-you note in a hurry? An email may be your best bet. Given our expectations for instant gratification, sending thank-you notes by email makes the most sense in many circumstances. After a job interview, or when someone has given you career assistance, you’ll want to express your thanks right away. Emails help you do it. However, there’s a right way and a wrong way to express your thanks in email format. Make sure your message is professional by reviewing email thank-you note samples. Not everyone sends thank-you notes to colleagues or employees who’ve done a great job. But, that’s all the more reason to do it – your thank you will really stand out! To send a note that fully expresses your gratitude, review samples before crafting your own message. And remember to keep it short and send it sooner rather than later. After a job interview is perhaps the only time during your career when a thank-you note is truly mandatory. Fail to send one, and you might just find yourself crossed off the list of potential hires. Use your note to reiterate your interest in the position and your qualifications, and to thank the interviewer for his or her time. Take some time to revise the thank-you letter you choose so that it reflects your personality and your interest in the specific job. Also think carefully about whether you want to send a thank-you email or a physical card or letter. If you know the hiring manager is making a decision soon, email is probably your best bet. However, if you have more time, a handwritten note always shows thoughtfulness. Not sure how to say thank you? There are so many people who help you during a job search and at many times during your career. Read advice on whom to thank and how to say thank you, including tips for writing thank-you letters and sample letters. Plus: tips on when to send handwritten thank-you notes versus thank-you cards versus thank-you emails. There are a hundred different ways to say thank you. When you're writing a thank-you note, it's important to choose a phrase that fits the reasons why you’re sending your message. You’ll want to tailor the thank-you note to the circumstances. Sometimes, it’s hard to know how to begin a thank-you note. You want to catch the reader’s attention and highlight the points you will make in your note. Writing a thank-you note shouldn’t be complicated, but the note also shouldn't be boring. Review these opening lines for a variety of business thank-you notes, and consider which one best fits your situation. Be sure to edit the lines to fit your personal circumstances. I was impressed with the opportunities the administrative assistant has at XYZ to pitch in and wear many hats. In my previous role, I was able to pick up graphic design and Excel skills, as well as some conversational Spanish and French. I love to learn new things and find different ways to make my team a success. It’s clear that I would have the opportunity to do that working for XYZ. I believe that my experience at my current employer has prepared me to slide seamlessly into the role. I’m familiar with all of your systems, software, and requirements, as well as being a quick study should other needs come up. Please let me know if I can provide you with any other information while you’re making your decision. Again, thanks so much for meeting with me. It was a pleasure.